I’m predicting that savory porridge will become the new pho/ramen. (Soapbox moment: pho is pronounced like the “fu” syllable in “fu*&.” Most have it right by now, but just in case….) Gone are the days where porridges were eaten to sustain. Now this pauper come prince dish has shed its bland coat and is strutting the streets (of 5th Avenue?) with its head held high. It’s had write-ups in Bon Appétite, circulation on the menus of notable restaurants such as La Petite Grocery in NOLA, and the home cook is blowing up Instagram and Twitter with pictures of their own gruel creations. So what defines a porridge? It’s a grain-whole, crushed or ground-boiled in a liquid. Simple. Almost every culture has a version of porridge: English oat porridge, Chinese rice congee, Mexican cornmeal atole, Finish rye porridge called ruispuuro…the list goes on. Cháo is a savory Vietnamese rice porridge made with broken rice, chicken stock and is topped with a fabulously sinful fried breadstick akin to eclair dough. It was one of my favorite foods as a kid and my mom would always make it for me when I was sick. It was my chicken soup. This recipe is a bit less traditional (I don’t have a ton of uses for broken rice and I’m not making fried dough on a Tuesday night) but it’s just as delicious. I can’t wait for you to cozy up in front of a fire or alongside your best (fur) friend with this bowl of nourishing warmth. Enjoy! You’re looking for the texture of soupy risotto. If too much liquid had been absorbed simply add more stock or water. You literally can’t mess this up. A green, an oil, something crispy and a protein is the key to maximize flavor, texture and nutrition. Swap in variations of those components to make it your own! Making your own fried shallots is simple, and the oil can be drizzled over the cháo and used to dress salads. David Tanis from the NY Times has a solid fried shallot recipe. In a medium pot, bring chicken stock to a boil then add rice, ginger, onion and black pepper. Return to a boil, turn heat to low and cover. Continue cooking the rice for about 10 minutes. Remove lid and cook while stirring for 5-10 more minutes or until it reaches a soupy risotto consistency. Add the fish sauce. 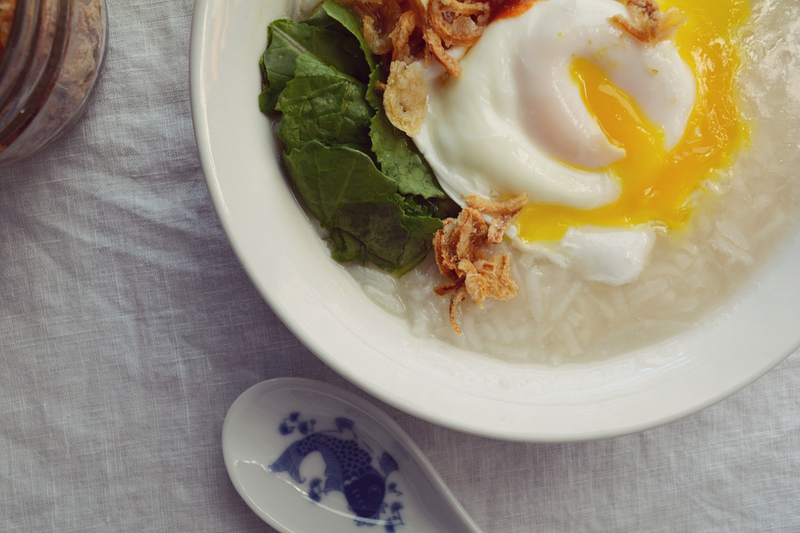 Accessorize you cháo: Divide up your porridge into bowls. Top each with a poached egg (see directions below), a drizzle of sesame oil, a handful of baby kale, sriracha to taste and a generous sprinkle of fried shallots. Get cozy with your loved ones and enjoy! There’s the vinegar method, the swirl vortex and the Julia Child “Pin an 10 Seconds” technique. I keep it simple. If it’s not simple I’m not inclined to do it. It may take a bit of practice, but once you feel comfy with the poaching process it will soon become one of your favorite ways to eat the incredible edible egg. Bring a small pot filled with 2 inches of water to a soft simmer. Your water is at the correct temperature when you see tiny bubbles rise from the bottom of the pot. Big gluggy, rolling bubbles will break up the egg, which is no bueno. Crack an egg into a small dish and then gently tip the dish into the lightly simmering water. Cook for 3 minutes. During this time you can scoop out the inevitable bits of egg whites that have gone astray. This makes for a prettier poached egg. Scoop out your perfectly poached egg with a slotted spoon or spider. Serve immediately or place in an ice bath and refrigerate for up to 8 hours.